I had no intention of making this one-pot curry tomato chicken recipe, except that I wanted something to dip the Indian Spiced Chickpea Flatbread into. That flatbread (socca) is so good that it deserves an entire meal to be developed around it! I could have made one of our favorite curry dishes, but decided to make something even faster and easier. And so this one-pot meal was born. 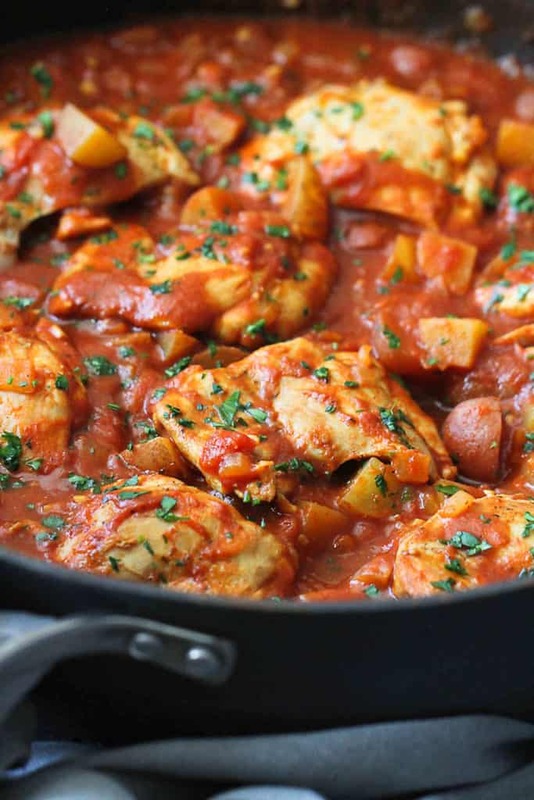 If you’re looking for more easy meal ideas, hop over to 9 One-Pot Chicken Recipes or Ten 30-Minute Healthy Dinner Recipes. I hesitate to call this a curry because it’s missing some of the components of a true curry. But it incorporates the essence of curry, with the addition of curry powder, coriander and cumin, and was all I needed to satisfy my craving and need for naan dipping. I typically use boneless, skinless chicken thighs in recipes where the chicken is simmered for awhile in a sauce. They are far less likely to dry out than chicken breasts and I find the meat to be more flavorful. That being said, if you really prefer to use boneless, skinless chicken breasts, just cut them in half crosswise and simmer for approximately the same amount of time. Just take care not to overcook them. The first time I made this dish, I cut the potatoes into bigger pieces (3/4- to 1-inch) and quickly found out that the potatoes needed much more simmering time to become tender. So, the second time around, I cut the potatoes into smaller pieces. That did the trick! 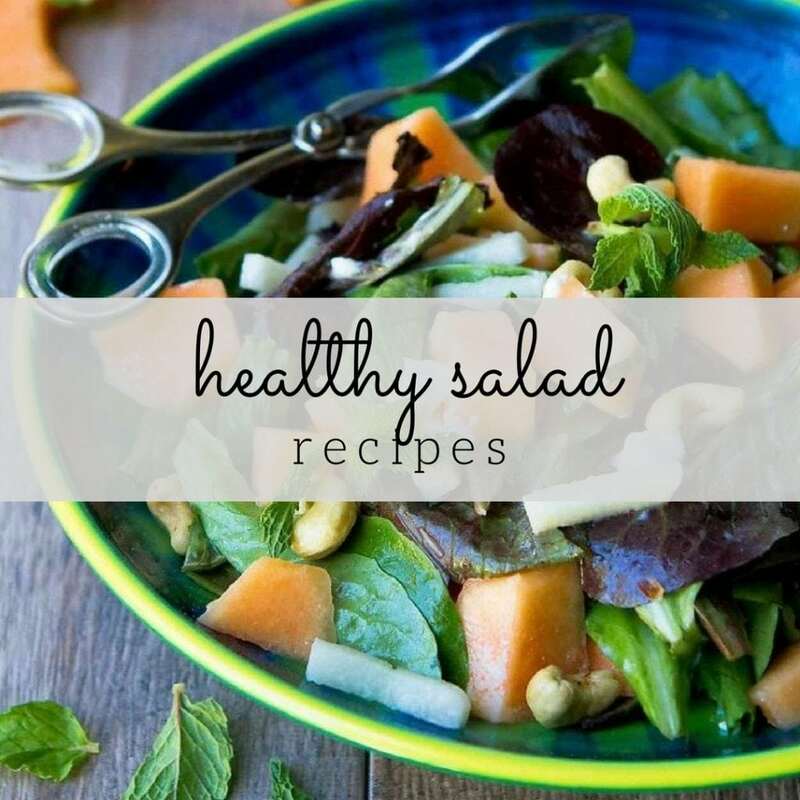 Serve this with steamed broccoli or a green salad, and a side of naan or cilantro lime brown rice for a delicious, easy dinner. Can this one-pot chicken meal be frozen? Yes! The meal should be cooked first before being frozen. Raw potatoes don’t freeze well. Once the meal is cooked, cool it to room temperature or refrigerate until ready to freeze. Divide the meal in the whatever portion sizes you desire and transfer to freezer safe containers or resealable freezer bags. For easy storage, arrange the freezer bags flat on a baking sheet and freeze so that you have easily stackable, flat portions. (Remove the baking sheet once the portions are frozen). To reheat, I prefer to defrost the portions in the fridge, then reheat in a skillet, but they can also be reheated in the microwave. Season both sides of the chicken thighs with ¼ teaspoon salt and ½ teaspoon pepper. Heat a large nonstick skillet over medium-high heat. Lightly coat with cooking spray. Add the chicken and cook for 2 minutes per side. Transfer the chicken to a plate. Heat the olive oil in the skillet. Add the onions and garlic, and cook until starting to brown, 2 to 3 minutes. In the skillet, stir together the potatoes, curry powder, coriander, cumin, tomatoes, chicken broth, ¼ teaspoon salt and ¼ tsp ground pepper. Bring the mixture to a boil, then reduce the heat to medium. Simmer for 15 minutes, stirring occasionally. Add the chicken to the skillet, cover and cook for 15 minutes. 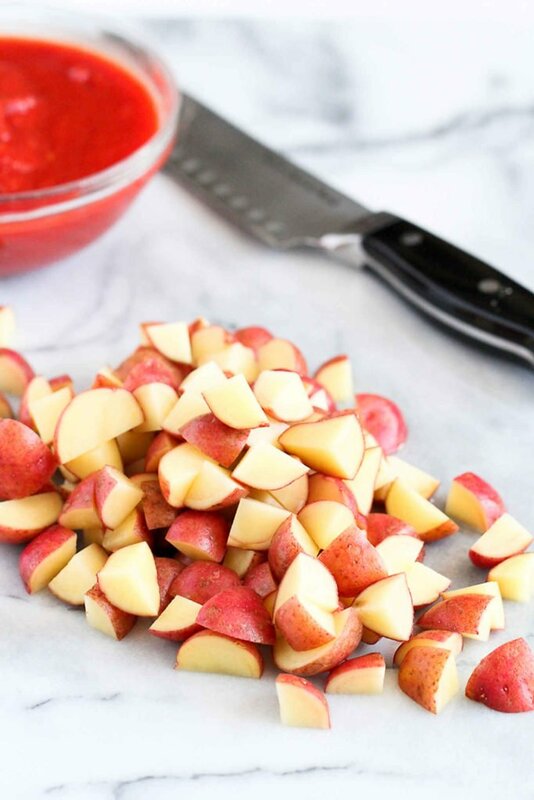 Uncover and cook until the potatoes are tender when pierced with a fork, about 10 minutes. Stir in the parsley. Season to taste. Serve. This post was originally published on March 14, 2016 and was updated March 20, 2019. 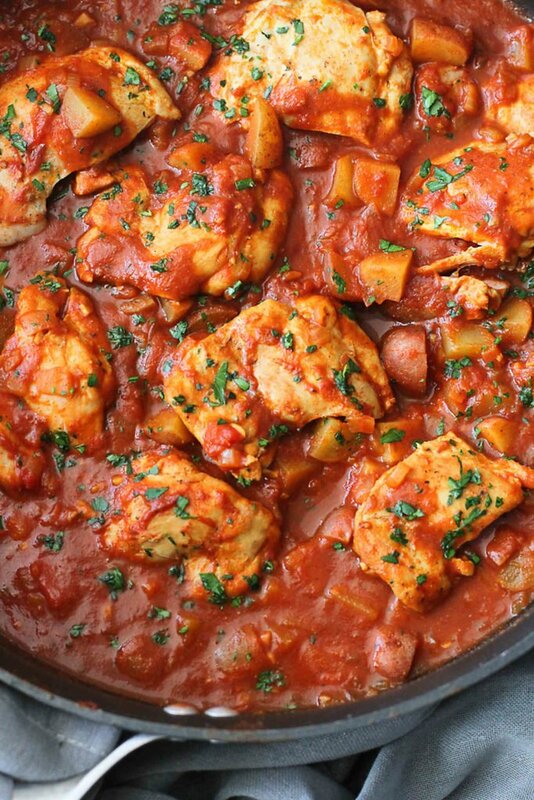 This looks like a serious comfort food – tomato sauce, chicken, creamy potatoes… yum! Is cumi supposed to be cumin? What is it about curry that makes us crave it so much? This looks absolutely delicious! this looks delicious! i have gone too long without a good curry! Ooooh, this looks and sounds so yummy! 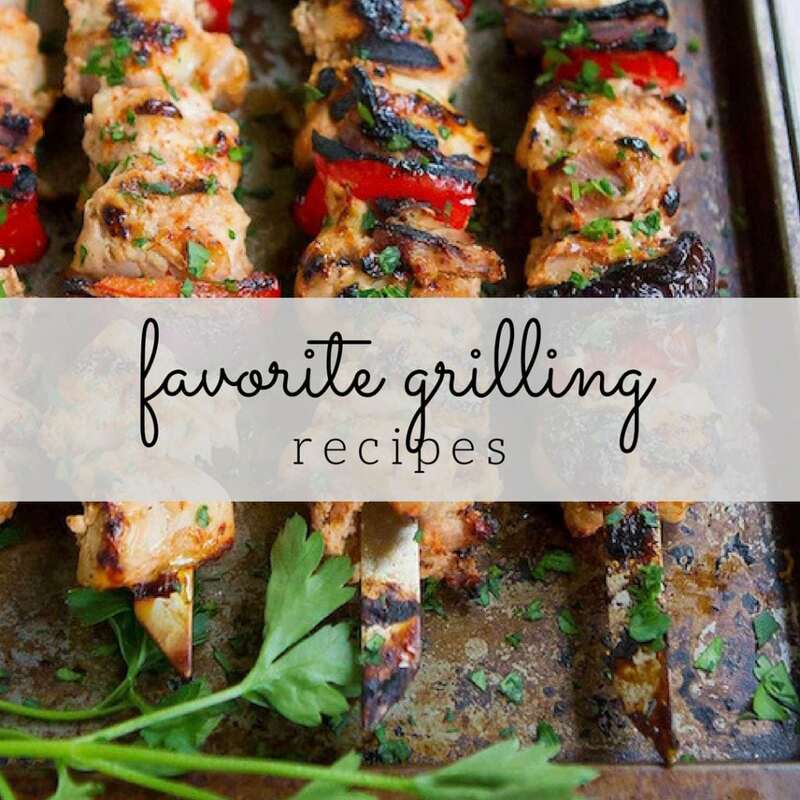 And I love that you used thighs – much more flavor than white meat! Thanks so much for including my Mexican taco bowl! Oh my gosh this recipe looks so good. Is it bad that I want some at 10am? Going to make this asap! 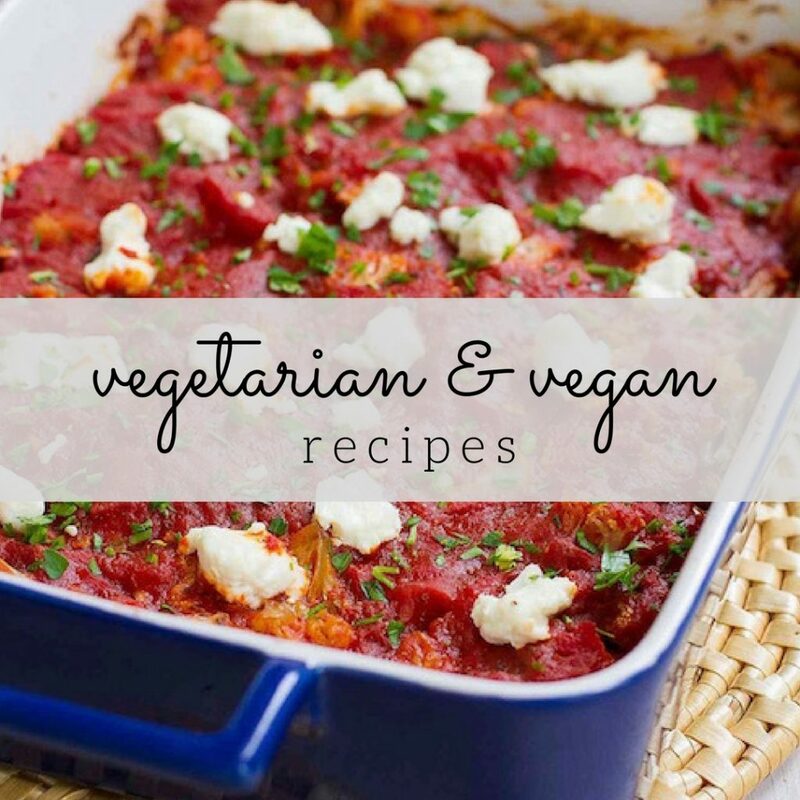 I’m always on the lookout for one pot meals and the flavors in this dish are amazing! This looks delicious. Who doesn’t love curry? I’ll be making this soon. I am not actually seeing a recipe. Is it missing in this post? Hi Linda, check it now. There was a mass hacking of a bunch of food blogs this morning that caused all sorts of problems. If it’s still not showing up, you may have to clear your browser cache first. 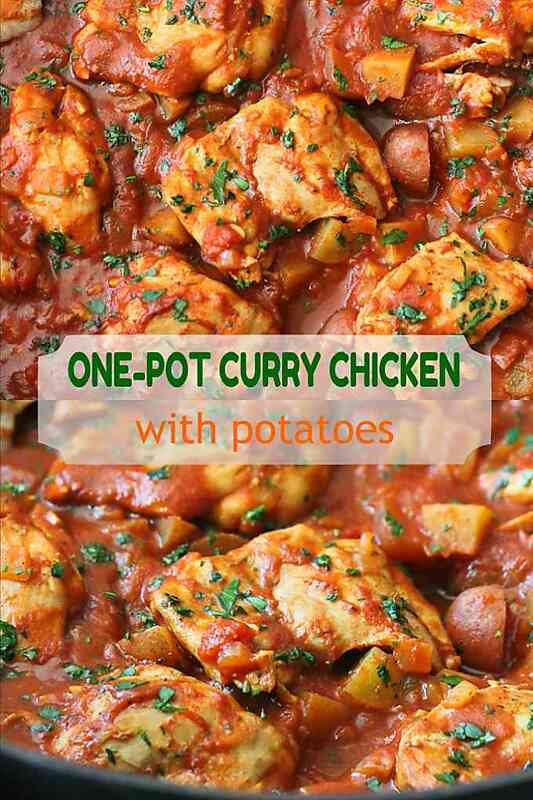 I love curry and who isn’t always looking for more one pot meals! Lovely recipe.